Chesapeake Bay Boats - the Bay's Unique Fleet of Vessels. 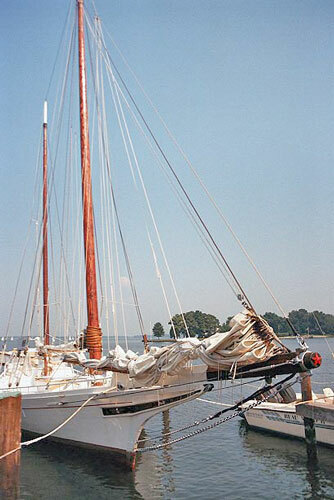 There are several types of boats that are unique to the Chesapeake Bay. Each originated as specialized work boats used by the seafood or transportation industries. Probably the most well know Chesapeake Bay boat is the Skipjack. Many of these graceful sailing craft were once found on the waters of the Chesapeake Bay. 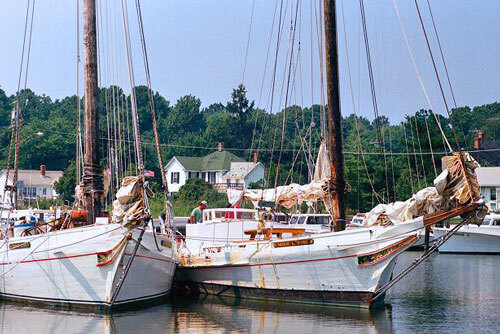 Only a small fleet of skipjacks still remain, and they have become something of an icon for the Chesapeake Bay region. Visit our Skipjacks page for more information about these classic boats. Read more about the Chesapeake Bay skipjacks. One Chesapeake Bay boat this is still very much in use today is the deadrise, which is used by most watermen on the Bay. 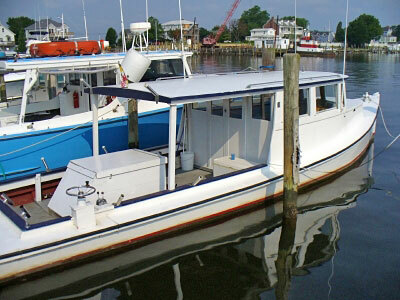 The Chesapeake Bay deadrise is a classic work boat, with a sharp bow which quickly drops to a flat bottom hull. Deadrises have a small cabin forward and a large open work area aft. These boats have a shallow draft of just two or three feet, making them ideal for the shallow areas of the Chesapeake Bay. The beautiful Chesapeake Bay Log Canoe isn’t what it’s name would suggest. The Chesapeake Bay Log Canoe is a sleek sailing vessel which originated as a workboat. These graceful boats continue to be raced on the Chesapeake Bay. The traditional log canoe is constructed from three to nine logs joined together lengthwise and carved to form the lower portion of the hull. Most log canoes have two steeply raked masts. 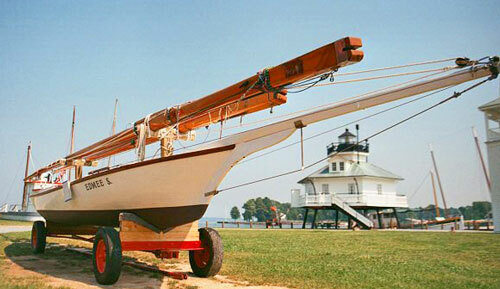 The Bugeye is another type of boat unique to the Chesapeake Bay. The bugeye was developed in the early 1860 as an evolution of the log canoe. As oyster harvesting methods changed from tonging and scraping to dredging, larger size vessels were needed to handle the larger equipment and larger hauls of oysters. The bugeye is built like the log canoe and measures 40 to 50 feet in length. This design has a fixed bowsprit, a forward cabin, and sails with a jib and a leg-of-mutton foresail and mainsail. The bugeye’s popularity as an oyster boat peaked during the 1880’s. Later, the cheaper to build skipjack was developed and replaced the bugeye in popularity as an oyster boat. The Edna Lockwood at the Chesapeake Bay Maritime Museum is the last remaining bugeye in operation.